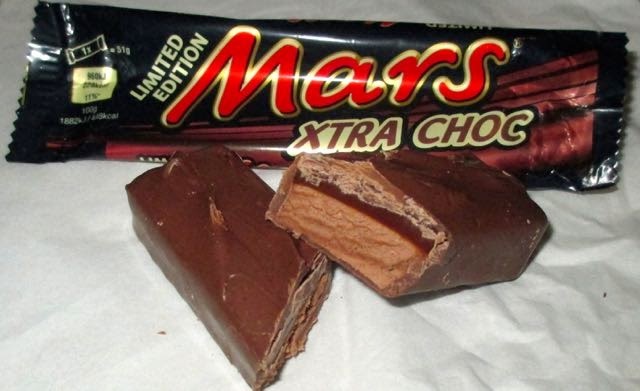 Following on from the uncreative new release from Kit Kat Toffee Treat, I have to say my heart slumped a little when I heard about the latest new edition to Mars, “Xtra Choc”. I can’t help but feel so disappointed in these large confectionary companies; their development team has a library of flavours available and then they go and pick some uber safe choices for the British market. As a country I can’t decided if we are just remarkably unadventurous or it is that we are a small country so they can’t be bothered with the product development, probably a combination of both to be honest. I think the economy doesn’t help, it puts these large companies off investing in anything that might be a little risky, everybody likes the simple options so that is where they stick. They still want to release new products so we end up with these strange limited editions that aren’t very different at all. This new Mars Xtra Choc is described as having “an extra chocolatey Mars Taste”. I guess Mars thought that they knew the British public likes chocolate so lets chuck more at the bar. For me the best thing about Mars is that slight malty flavour that is packed in the nougat layer. This particular version had extra chocolate in that layer, which did work nicely with it. I can’t lie, I like Mars chocolate and more of it was nice. Would I go desperately hunting this bar out, or panic buy them when it comes to the end of the limited edition period absolutely not. Its fine, it is what it is, but it is far from exciting the person who set up Foodstuff Finds with the intention of reviewing all the crazy products out there. Here is hoping some of the big brands have some more exciting goodies planned for release throughout 2015, January has seen a slow start from the high street chocolate companies. If you haven't already tried one, you really must try a US Milky Way. It is maltier than our Mars and reminds me of Mar Bars as a kid. They are excellent. I've never understood why the import shop sells bars that look identical to ours, but I'll take your advice and give them a try.